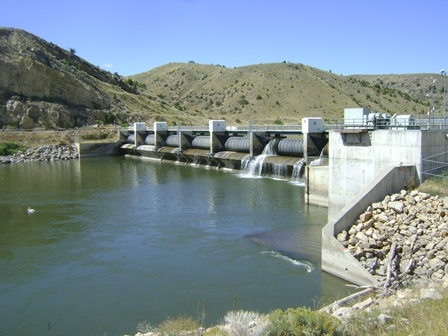 The Hydropower Program administers the development and operation of hydropower facilities on state-owned water projects. To-date one hydropower facility, the Broadwater Power Project near Toston, has been built. The project began generating power in June 1989 and has an operating capacity of 10 megawatts. DNRC owns and operates the facility; the electrical energy produced is sold to NorthWestern Energy. Revenue from the energy sales provides funds for other SWPB water project (which includes 22 dams and approximately 250 miles of irrigation canals) repairs and rehabilitations. Most of these large projects were completed in the 1930s and 1940s and have significant needs. The facility is capable of generating roughly 56 million kilowatt-hours of electricity based on average river flows. Gross revenue power sales in 2014 totaled $4,221,877; after debt repayments and operating expenses, approximately $1.3 million is available for use on other projects.